history of providing quality education to the students of British Columbia. The College traces its origins back to 1979 with the Buttertree School of Sound which later became the Center for Digital Imaging and Sound. The school was acquired by The Art Institutes in 2002, and added the famous Dubrulle International Culinary and Hotel College of Canada in 2003. In 2017, The Art Institute of Vancouver became LaSalle College Vancouver, a member of the LCI Education network. 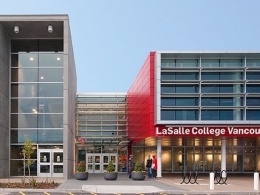 LCI Education traces its Canadian origins back to LaSalle College in Montreal, which was founded in 1959. Present today on 5 continents, the LCI Education network consists of 22 select higher education institutions in cities such as Montreal, Barcelona, Melbourne, Jakarta just to name a few. LaSalle College Vancouver is designated by the Private Training Institutions Branch (PTIB) of the Ministry of Advanced Education of British Columbia and registered with the Ministry of Advanced Education, Student Services Branch. Since 2004, LaSalle College Vancouver has been offering an array of exciting applied arts programs in such diverse fields as Animation, Culinary Arts, Digital Film & Video, Event Management, Game Art & Design, Graphic Design, Interior Design, Professional Recording Arts, VFX for Film and Television, Video Game Programming, and Web Design. Describe your career goals and how the program can help you to achieve those goals. Please check website for program specific requirements details.